Have a question, we may have already answered it... many times. Here is a list of our Frequently Asked Questions. 1. What is the proper way to maintain my sword? All metal parts of your sword, including the wired wrapped handles, should always be covered with a light coating of oil to prevent rust. Your sword comes to you with either a light plastic spray or a heavy coating of grease to protect the blades in transport across the ocean. 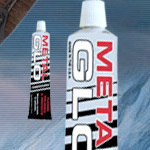 You can remove these coatings with the use of a good solvent such as mineral spirits. Once you’ve finished this, apply your light coat of oil or a silicone spray. For Damascus blades, use a light oil only. To remove rust spots, sand with emery paper of about 600 grit, then promptly reapply a light coat of oil. 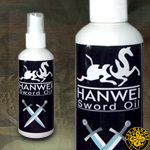 Leather Sheaths and scabbards as well as leather covered handles should be treated with a good paste wax. The scabbard can also be treated with neatsfoot or mink oil for waterproofing, although this is not recommended for gripping surfaces. Do not store your sword in its scabbard for long periods of time since the leather traps moisture which can produce rust spots on the blade. Do not bang your sword against another sword in a theatrical-style duel. Do not bang your sword against any hard object to test its strength or the "sound" of the steel as it hits a hard object. No matter how tough or strong the steel is in any sword, it will nick when struck against something equally hard. In stage plays or in movies, theatrical swords with wide, thick edges are used. The edges are flat and often as much as 1/16 inches wide. Such theatrical swords are designed to take the flashy looking punishment of banging edges together. 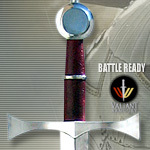 Your sword (Battle Ready, i.e Valiant Armoury or Cold Steel) is not a theatrical sword. Such swords are REAL WEAPONS, designed so that they could fight in the manner that the originals were actually used. Since cutting edges could easily be sharpened and were often important for slashing, parries were made with the flat of the blade (not the edges) or were simply avoided altogether. Real swords were never used for the theatrical style of sword banging that the movies or stage plays rely on to liven up the action sequences. Although stainless steel is thought by many to be invulnerable to corrosion, this is not true. With stainless steel, one must be cautious because the evidence of corrosion does not show itself as quickly as it does on carbon spring steel. If the blade is touched with a finger and not wiped off properly with a soft rag the fingerprint will be permanently etched into the steel forever! In time, the print will become more and more visible and detract from the appearance of your sword or dagger. To prevent this from happening, Keep Fingers Off the Blade! If possible keep the blade away from any bare skin, as skin is very acidic. It is the acid in your skin that will eat away at the metal and the only way to stop it is by giving the blade a thorough cleaning. Many battle ready blades are made of high carbon steel and need care to keep them rust free. First of all, DO NOT LEAVE A STEEL BLADE IN A SHEATH FOR A PROLONGED PERIOD OF TIME OR IT WILL RUST. To keep a blade rust free, applying oil on the blade is the most popular practice today. There are two types of oil one can use: natural or synthetic. Natural oils like mineral oil, camellia and clove oils are very good. Silicone, which normally comes in a spray can is an excellent synthetic oil and we highly recommend it. To oil the blade, first clean it with cloth or a paper towel. Then apply the oil leaving only a thin film. This procedure should be repeated every 1 to 6 months depending on the storage area and humidity. A humid climate will require more frequent cleaning. Minimize touching the blade. Acids from the fingers etch carbon steel. For long term storage, keep or display your blade out of the leather sheath. For swords in wood scabbards, leave them inside to prevent the scabbard from warping. Wooden parts of the sword, such as the handle and the scabbard can be protected by lacquering, varnishing, or waxing. Furniture lemon oil is good for cleaning the wood. For high end Japanese swords, please follow instructions here and special Japanese cleaning products here. 2. How do I install and use a Magnet Hanger? 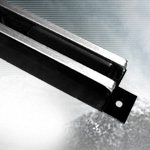 IMPORTANT INSTALLATION TIPS: The magnet sword hanger is a favorite choice among professionals in the industry. It permits one to hang a sword at various angles, crisscross, fan shapes, is very easy to install, remains visually hidden behind he blade, and offers quick and easy access to the sword. Unlike post hangers which require level accuracy, the magnet hanger allows the sword to be straightened by eye much like a picture frame. AVOID SCRATCHES: Accessible mounting and dismounting your sword from the magnet mount can eventually begin to scratch the surface of a blade due to metal to metal contact between sword blade and the magnet surface. We like to place a layer of cellophane or cloth tape face down on the magnet surface between the magnet and the blade. This will reduce the possibility of scratching over time. When dismounting, we carefully "turn" or "roll" the blade from the mount rather than sliding or pulling against the full force of the magnet. USING A SPACER FOR CRISS CROSS DISPLAY: Creating a spacer that is at least a blades width in thickness and placing it between one of the magents base and the mounting surface will keep the blades from conflicting at their intersection point. This is necessary to keep each blade in secure contact with each magnet surface. Not to do so will create an unstable and unsafe mount. Such a spacer can be created at any width and pitch so you can design your display to your own preferences and distance allowance from the mounting surface. The magnet itself measures about 1 inch in height from mounting surface to blade contact surface. 3. When you say that your swords are battle ready are you talking about they are built for battle or are they sharpened as well? Logically speaking it would seem to me that "battle ready" would be a term describing both battle worthiness and readiness which would imply that they are sharpened as well. But as soon as one mentions sharpened you have different levels of sharp, i.e. factory sharp, factory dull etc. The "level" of sharpness can be of concern to many customers. Tempered steel can be sharpened to a razor sharp edge and some people would rather have the option to bring it to such a grade themselves rather than the factory as just handling them can draw blood... thus you see how definition of terms can become tricky. Then you must consider that some swords have blades that CAN be sharpened but are NOT full tang and should then be considered more for decoration and not used for anything other than wall hanging or slicing butter. I have seen marto decorator swords with very sharp edges but I would hesitate to whack a tree with such a sword as the handle would probably soon snap. Thus how could you categorize its readiness? In such an instance, the blade is not zinc but rather high grade steel, which CAN be sharpened thus become "battle ready" yet the lack of full tang handle makes it in no way "battle worthy". I don't believe we have used the term "battle ready or battle worthy" on any sword that could be considered a decorator sword and is not full tang. Whether it is "sharpened from the factory" or in a "can be sharpened" status, I don't feel is in conflict of terms when using the term "battle ready", as the important factor would seem to be if it is a blade that can take an edge. If you have a specific sword that you are interested in, I can tell you if it comes factory sharpened or dull, if it is full tang, and if it can be sharpened. In most cases, our use of the "Battle Ready" term describes Full tang construction , factory dull sharpness, tempered steel that CAN be finely sharpened to preference. 4. My sword has rust spots, what do I do now? Hello, do you ship to Australia? If so how much is shipping? It all depends on the item and if it can be shipped via United States Postal Service. Send us an email and we can give you a better idea of price. Further to Luke’s email; the sword we are interested in is the Vorthelok Gold Limited Edition (KR0046G). Luke has sent an email – no response. There are no importation restrictions into Australia according to the Australian Customs office. If sent through the postal system it has to be packed very well ( as I am sure it would have to be in the US) as per the Australia Post guidelines. What is the cost of shipment to Australia be please and delivery time?